First off... Happy New Year to you all! I've already said this on Facebook and Twitter so I'm sorry if this comes off as repetitive but — Very special thanks to everyone who had been part of my 2010. It was fantastic. Let's make 2011 even better! During the holiday break, I finally had a bit of time to pick up my cosplay photo backlog. We had this photoshoot way back in October! As with the other photos from this series, my goal with the photography and editing was to emulate the look and feel of the game artworks. The reference illustration for this shot was this [link] Dom ~Weakman, one of our friends who accompanied us during the shoot, helped toss the straps of Miguel's head protector so we could get that perpetual wind effect that Hakuouki official art seems to be so fond of. 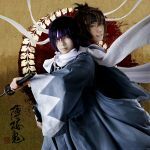 My friends and I have been interested in the historical Shinsengumi for many years now, and pick up almost any work of fiction that involves them. We decided to cosplay Hakuouki after seeing artworks from the game around the time it was released. The art style was the type that appealed to us, and we thought the character designs were excellent. We loved all the detail and patterns — although Miguel had not yet been able to print the pattern on the black fabric at the time we had this shoot, which was more for practice. Miguel actually felt a bit conscious that his face shape is too round to suit the character. To work past this, I arranged the layers of the wig around his face in a certain way, and shot him at an angle in which his face looks longer and more angular. Hope this helps other people who might have a similar problem! I have to admit, watching ANTM can be educational. Okita Souji is one of the more prominent and well-liked members of the Shinsengumi. I often tear up when I read about him. His tragic illness aside, he was known for being one of the most formidable swordsmen. In addition to that, cccording to many sources he was a big joker and was said to be a pretty nice guy. He was even often seen playing with local kids at Mibudera. B E A U T I F U L L 1!!!!!!! haha, you definitely fixed any problem there might have been with his face shape---- this is AWESOME! Oh my god, that's amazing. He looks so hot... It's as if Okita had come to life. (o_o) I'm amazed... and maybe a little in love! (^-^) Awesome cosplay, as always!! Congratulations!! You have been FEATURED!!! where do you get your cosplays!? there awesome! Wow, at first I thought this was a painting :0 Great job, guys! Miguel makes a gorgeous Okita. Great! Aways a good job! i dont know why but it kinda doesnt look like miguel. but its still awesome. idontknow there's something different. haha. awesome cospaly as usual. haha. i just finished watching the 2nd season, and now I'm so uberly depressed i want to gouge my eyes out but wonderful cosplay!!! I'm planning on cosplaying as Okita for an upcoming convention, so i need all the reference pics I can get!! Miguel looks fine as him! HA! I saw both anime seasons, yeah, you're right, first is awesome, second goes terrible, I mean, everybody D:... ok no, no spoilers but! WTF!!?? However, I don't see the last chapter yet, so, let's see how it turns, but, meh! at this level I don't really care about the end >:U. 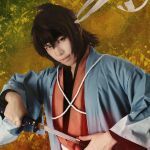 Well, Miguel looks just awesome as Okita, it's me or this character makes him look emm... effeminate... XD, ooh well he looks just awesome so who cares XD! Great job as always! This is wonderful! The background, the pose and the costumes are really well done xD Great work! I especially love Miguel's face here. It looks different from most of your other cosplay photos (I think your trick to make it look angular really worked xD) and the expression is lively and very striking. I hope I get to see you guys if we ever go to Manila! Woah, he looks really different!! I agree with you on the anime adaptation, I rather stick with the game. I like how I can barely recognize Miguel and all I can see is Okita's character artwork. LOL, I am not a huge Hakuoki fan but I do appreciate the character design. Wow you watch ANTM too? It depends on each cycle if it's good enough to watch. The last cycle was bad to me anyway. that is one really good cosplay! I absolutely love his expression!! >///< Miguel looks so bishie! !